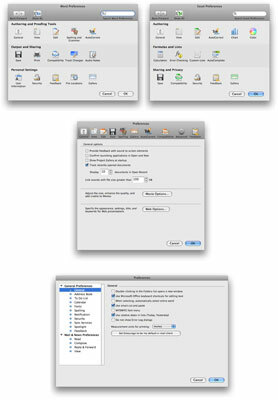 Each Office 2008 for Mac application has many different preference settings you can alter to suit your needs. Most (if not all) preferences let you enable, disable, or specify values for the way features work within the program. You can choose the setting that makes the feature work the way you want it to work — to figure that out, you’ll want to spend some time experimenting with the various Preferences settings and customizing your Office applications to work the way you prefer. 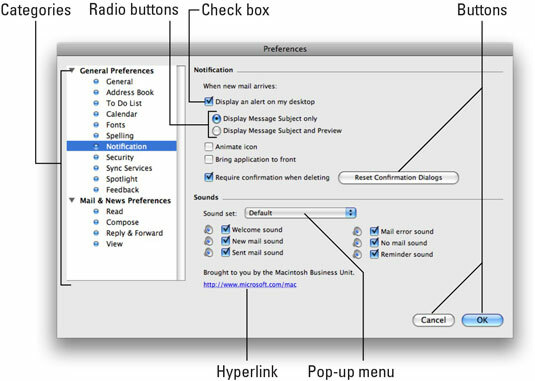 You open the Preferences dialog the same way in all four Office 2008 applications: Choose Preferences in the application’s menu or press Command+comma. Although the four Preferences dialogs look slightly different, they all work pretty much the same, as you can see in the figure. (Clockwise from upper left) The Word, Excel, Entourage, and PowerPoint Preferences dialogs. Each application’s Preferences dialog has ten or more categories. The Word, Excel, and PowerPoint Preferences dialogs denote categories with icons (General, View, AutoCorrect, and so on), whereas Entourage lists its categories by name. When you click one of these categories, you’re said to be using that category’s preference pane. To see the items in a category, click the category’s icon or name. When you do so, the Preferences dialog changes to display that category’s preference pane. Entourage’s Notification pane offers most of the features, such as check boxes, radio buttons, buttons, pop-up menus, and hyperlinks that you’re likely to encounter in preference panes. The Search field: This field allows you to search for a word or phrase in any preference pane, which is handy if you know of a preference you want to change but can’t remember which pane it’s in. The Show All icon: You can click this icon when you’re done with a preference pane and want to return to the main Preferences dialog with all the icons available. The Forward and Back buttons: These buttons work the same as Forward and Back buttons in the Finder or a Web browser do: The Back button displays the panes you’ve visited since you opened the Preferences dialog in reverse chronological order, and the Forward button takes you back the way you came when you pressed the Back button.